This post by Jesse Pirini, past 3MT winner, first appeared on Thesislink in 2012. Jesse is now a postdoctoral fellow, and will give a talk at the PG Week Welcome Breakfast on 14 August 2017. I wasn’t sure what I was getting myself into, but then thought – what have I got to lose? Preparing the talk was initially harder than I thought, but it got easier once I had my topics sussed and a general outline. The three minute format is really different from anything I’ve done before, but really valuable in forcing you to focus, and be sure you can clearly define any concepts clearly and quickly. Then it was a matter of practicing it to make sure I had my timing right, and didn’t forget anything. I spent about two weeks preparing my talk. Before I started I watched videos of previous competitors in the trans-tasman finals, which was really useful to get an idea of what you could do with three minutes. I mostly prepared by doing a talk, timing myself, figuring out what my key topics were, and repeating until I had the topics sorted. I found it useful to prepare and practice with a friend who gave me feedback and made sure that what I was saying made sense! I was pretty nervous on the day. I practiced a fair bit on the actual day and I was fluctuating between being about 20 seconds over and 10 seconds under. I realised I should figure out where I needed to be by about 2:30. I spent a bit of time figuring that out, so I could speed up a bit if I had to, or slow down a little. When we were sitting down waiting to start I was getting really nervous. I’m glad I wasn’t one of the first to go, it made it a bit easier to see a few others go first. In fact I was last, which wasn’t ideal, but better than being first. Once I was up and going I felt really comfortable. The practice I had done came back to me and I knew where I was going with the talk. I had found out what room we were going to be in and checked it out earlier in the day. That helped because I had some idea of what to expect and had actually stood at the front of the room when it was empty. For winning I was honoured to receive a $1500 research award, and a laptop. I also won a $300 printing voucher for the audience favourite award. It’s worth doing for the great prizes, and equally for the experience of having to translate your work into something that you can describe to anyone. The focus on figuring out real outcomes that ‘matter’ to people, rather than just to you is awesome. I recommend for everyone to enter and have a go. Entries for the 2017 3MT competition close on Monday 10 July. Please note that prizes for the 2017 competition will differ from those mentioned in this article. 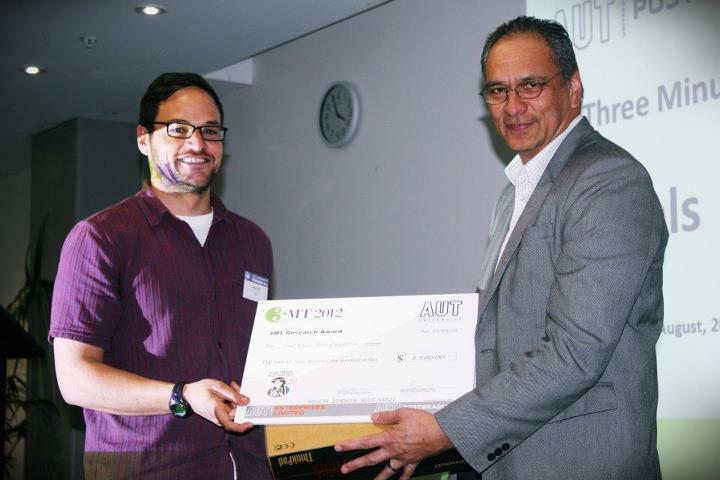 Jesse Pirini was the 2012 winner of the AUT Doctoral 3 Minute Thesis competition. He is now a postdoctoral fellow at AUT and author of the recent book "Peer Tutoring: A training and facilitation guide."